How does the idea of monsters fit into the Christian walk? The fourth short story anthology from The Crossover Alliance released this past Halloween. I don’t have a story in it but several of my friends do, and one look at the cover tells you this collection is intense. 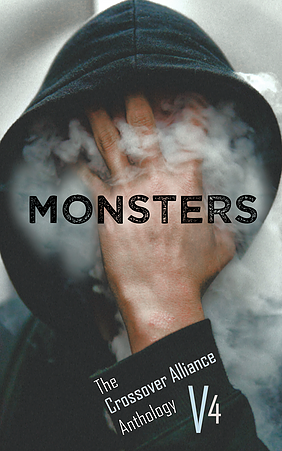 The theme is “Monsters,” but as the cover image indicates, monsters often come from within. So how does the idea of monsters fit into the Christian walk? Everyone has their own concept of monsters, but they generally have common characteristics: large, grotesque, vicious, wild, hungry, predatorial, and scary. Movies like Monsters, Inc. capitalized on these characteristics with humorous intentions, but even a cartoon acknowledges that monsters terrify us. It’s not the same fear that snakes or spiders inspire, because those creatures are much smaller than humans but are creepy and crawly and slithery and darty. Monsters aren’t usually associated with speed or stealth (the xenomorph in Alien is a notable exception). The source of their terror is their hulking size and giant claws and dripping fangs. Animals with monstrous qualities exist today (lions, tigers, sharks, squid), in pre-history (dinosaurs), and mythology (Hydra, Cyclops, dragons, Godzilla, Cthulhu, etc.). TV and movies allow us to watch city-flattening behemoths wreak havoc from the comforts of our living rooms, but for the longest time, stories about monsters were passed down over village campfires, and people believed they were true. Man’s footprint was much smaller before the Industrial Age and the mountains, the forest, and the seas sheltered terrifying creatures that would gobble up any reckless villager at a moment’s notice. As technology advanced, we discovered what monsters were indeed real and which were fantasy, and our weaponry gave us the upper hand. Now we get the popcorn ready for Shark Week and watch Chris Pratt turn into the Raptor Whisperer. As Nature’s monsters have diminished, there is still one realm which we have not conquered: that which is inside ourselves. Monsters like addiction and rage and psychopathy still wreak havoc in human hearts and decimate families, relationships, careers, and futures. It would be folly to speculate on whether these monsters are getting worse today compared to ages past, but with more people on the planet, the opportunities for monsters to arise has undeniably grown. Like the monsters of lore, these inner demons are massive, ugly, and destructive. We often feel powerless as we watch these monsters destroy the things we love. Yet despite the hopelessness we may feel, we are children of a God who is bigger than any monster, real or imagined. Contemporary Christian kitsch often portrays God as our pal, walking along the beach with us. While this is true, He is also the Creator of galaxies and the Smiter of stars. He knows every iota of our being and there is no monster within us that is too strong for Him to defeat. Now, He may not show up with a blazing sword and slay the dragon in dramatic fashion. 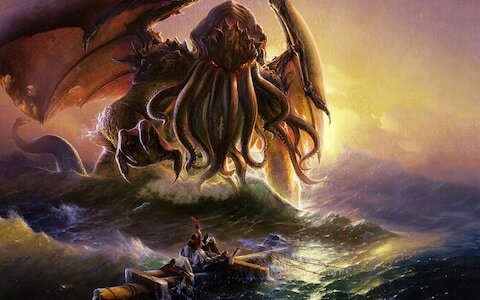 Perhaps He will allow the monster to roam free within us for a while to strengthen our faith or teach us a lesson. But as His children, we are promised that all things will work together for good for those who are called according to His purpose (Rom. 8:28) and that through Him, we are more than conquerors (Rom. 8:37). We may walk through the Valley of the Shadow of Death, but we need not fear any evil, for He is with us (Ps. 23:4). We may feel that the monsters we face are too much for us, and we are right. But they are not too much for God. The only weapon we need to do battle is faith.